Creep is the slow plastic deformation of metals under constant stresses or under prolonged loading usually at high temperatures. Creep is specially taken care of while designing I.C Engines, Boilers, and Turbines. Creep at lower temperature is known as low temperature creep and can occur in load pipes, roofings, glass as well as in metal bearings. Creep at high temperature is known as high temperature creep. 1. Displacement-limited applications in which precise dimensions or small clearances must be maintained such as in turbine rotors in jet engines. (Figure 1a). 3. Stress-relaxation-limited applications in which an initial tension relaxes with time such as in suspended cables and tightened bolts (Figure 1c). In these types of applications, design engineers must consider creep deformation and its dependence on time and temperature. Many mechanical systems and components like turbines , steam boilers, and reactors operate at high temperatures and creep properties for the materials used must be determined. 1. 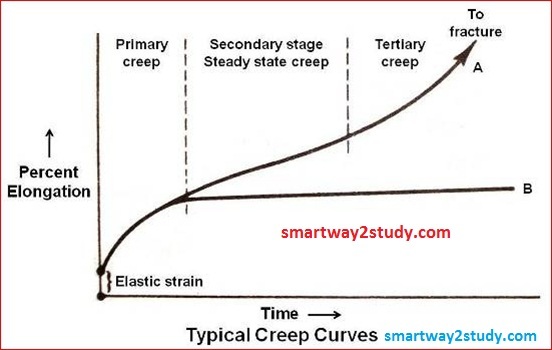 Primary creep where the rate of change of strain (creep rate=∆ε/∆t) decreases with time due to strain hardening of the material. 2. Steady-State creep where the strain increases linearly with time. From design point of view, this region is the most important one for parts designed for long service life because it comprises the longest creep duration. The main creep test result is the slope of this region which is known as the steady state creep rate (′εs). During this stage of creep, thee is a balance between strain hardening due to deformation and softening due to recovery processes similar to those occurring during the annealing of metals at elevated temperature. 3. Tertiary-creep where the strain increases rapidly until failure or rupture. The time to failure is often called as the time to rupture lifetime (tr). This parameter is an important consideration in designing against creep for parts intended for short-life applications. 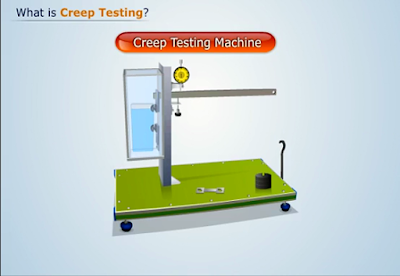 To determine the rupture lifetime, the creep test must be conducted to the point of failure. 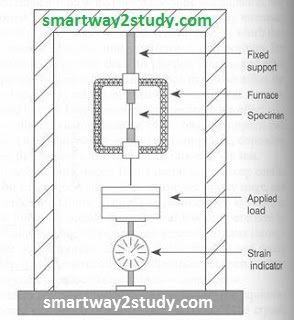 Such test is also known as the stress rupture test or creep rupture test. The values of the three constants K, Qc and n describe the creep of a given material and if they are known, you can calculate the steady state creep rate at any temperature and stress using equation 2. 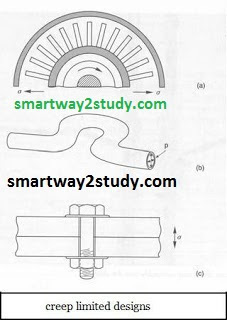 However, these parameters vary from material to material, and have to be determined experimentally. (1) load: Creep strain varies with the applied load. With applied stress(load) creep strain rate increases. (2) Temperature: High temperature increases creep rate. At higher temperatures materials undergoes more creep strain compared to one at lower temperatures. (3) Composition: Pure metals with high melting points and compact atomic structure generally exhibit more creep resistance at high temperature. By allowing the pure metals with suitable elements, the creep resistance can be increased considerably. (4) Grain size: The major factor in creep is Grain Size. Usually coarse grained materials exhibit better creep resistance than fine grained. At lower temperatures a material with a smaller grain size has a slower creep rate. Coarse grains show higher creep strain.